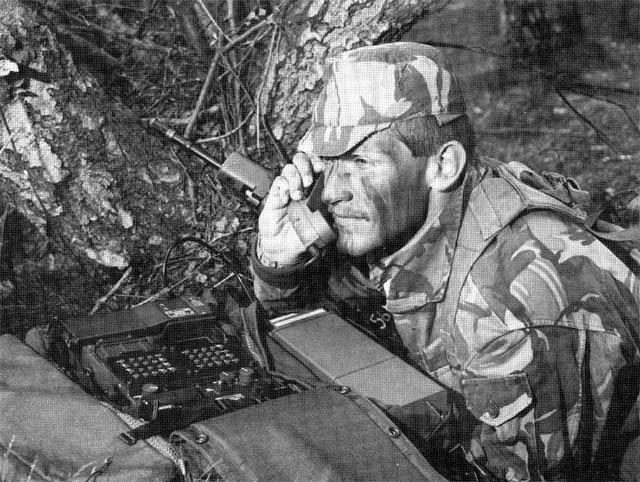 The Clansman PRC-319 is a real Spy Radio as used by the British Special Forces (SAS) in England as well as USA, Australia, and New Zealand. There were only 350 units manufactured for use in England by MEL. The PRC-319 is a 50 Watt modern microprocessor based radio transceiver that transmits in both the HF and VHF bands, up to Aircraft frequencies for ground to air communications. Frequency range is 1.5 to 40 MHz with LCD frequency readout. The Electronic Message Unit EMU is a small alphanumeric keyboard that allows transmission of written words when voice transmissions would be dangerous, as well as data, coordinates, and direct communication with fire control and direction computers. The PRC-319 is also a burst transmitter which can store messages for up to 500 hours before automatically transmitting it at a high data rate. The radio can be operated by remote control from up to 50 meters away. The burst transmission feature allows considerable security over conventional radios. Transmitting range is 20Km with short antenna and up to 5000Km with a whip antenna. The radio operates from a 24VDC standard Clansman battery.The equipment and accessories are supplied in very good condition, tested and operational. Please choose from a range of accessories that is available below. Please note, EMU option is not available at the moment. Frequency Range: 1.5 - 40 MHz. Channel Storage: 10 Receive / 10 Transmit Channels. Output Power High Power: CW (Morse) & Voice (SSB) greater than 50 W PEP. Output Power Low Power: Between 2-5 Watts. Modes of Operation: SSB, AM, CW. Turf Tunning Time: <220 ms.
Electronic message unit EMU BA1304. Long BNC Antenna Feeder Cable. Headset with built in microphone. 2.4 Meter Whip Antenna Rod. BNC Adapter for TURF Not Original. Clansman 24 Volt Rechargeable Battery. Light Weight Metal Back Pack. Canvas Back Pack. DPM Back Pack.